This year's theme is “Speak Up: Know Your Rights and How to Use Them.” The theme emphasizes the importance of residents being informed about their rights; being engaged partners in achieving quality care and quality of life; and feeling confident in speaking up about what is important to them. Each year, the Consumer Voice develops a packet to help you plan your Residents’ Rights events. The packet is completely downloadable and features ready-to-use items, including promotional materials, activities to celebrate Residents' Rights Month, training tools and resources. Click the example to the left to see this year's entries. 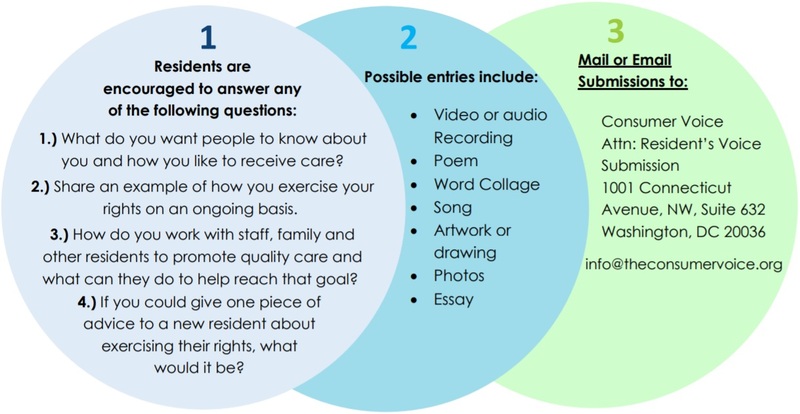 Long-term care consumers are encouraged to pick up their pens, dust off their type writers or use a computer to display their writing or artistic skills by submitting essays, poems, artwork, drawings, or videos related to the theme for Residents' Rights Month "Speak Up: Know Your Rights and How to Use Them." Perfect to give to volunteers, residents or other advocates! Available in packs of 20, 50 and 100. The set includes five 11"x17" poster each featuring a different essential residents' right and a quote from a resident illuminating the importance of the right. The poster series are a useful visual reminder of residents' rights. See all five posters here. Available in a set of 5 posters or as a bundle including 10 bookmarks. Residents' Rights Month Activity Calendar - A printable calendar (updated for 2018) with event and activity ideas for each day during October. Get your planning started now! Have something planned for Residents' Rights Month? Was Residents' Rights Month featured by local media or government? Send details and photos to info@theconsumervoice.org. The Governor of Florida, Rick Scott, wrote a letter offering greetings and best wishes to all observing October 2018 as National Long-Term Care Residents' Rights Month. Read his letter here. Ombudsmen in Minnesota are promoting Residents' Rights Month, including recommendations for celebrating and a learning circle exercise. Long-Term Care Ombudsman Jan McFerron wrote a letter-to-the-editor of the Southeast Missourian. Long-Term Care Ombudsman Michelle Motta wrote a letter-to-the-editor of the Evansville Courier & Press in Indiana. 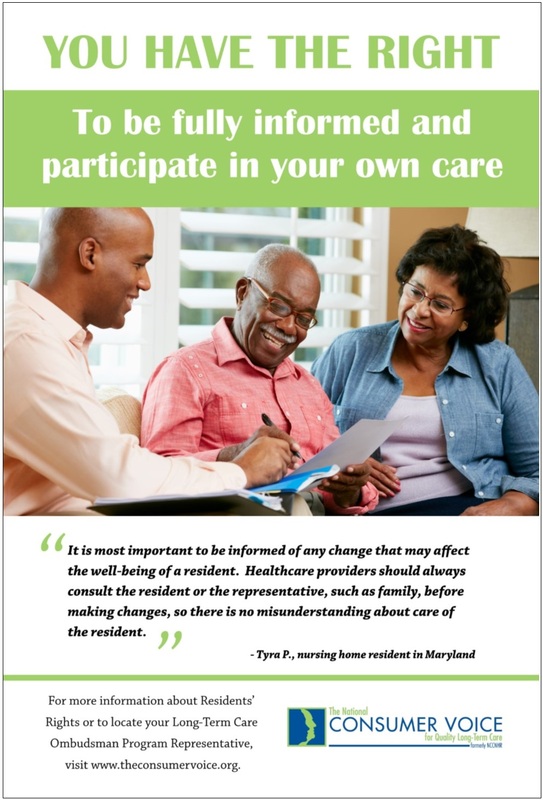 Residents' rights was highlighted in an article in the Kent County News in Maryland. 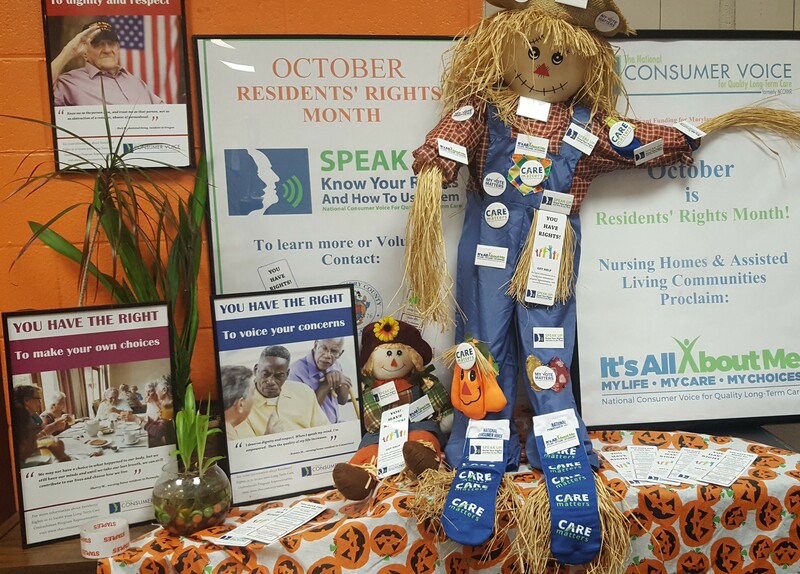 Regional Ombudsma Coordinator in North Carolina Cindy Englert arranged a Residents' Rights Month celebration, which was highlighted in the Gaston Gazette. The Greeley Tribune in Colorado published an article about the Board of Weld County Commissioners recognizing October as Residents' Rights Month. Georgia Governor Nathan Deal proclaimed October Residents' Rights Month. In Colorado, the San Juan Basin Area Agency on Aging highlighted several Resident's Voice entries in the Pagosa Springs SUN. The mayor of Palm Shores, Florida proclaimed October Residents' Rights Month. The mayor of Heber Springs, Arkansas visited a nursing home to proclaim October Residents' Rights Month. An article on Residents' Rights Month appeared in the Tahlequah Daily Press in Oklahoma. 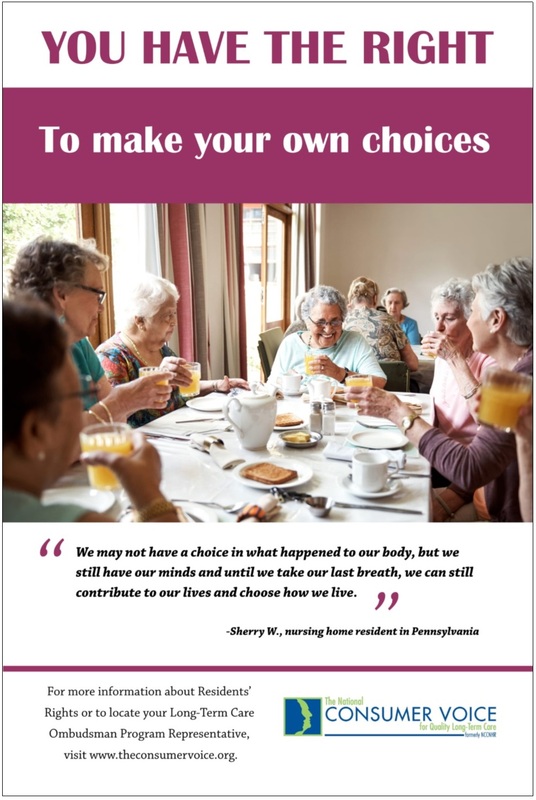 An article was published in the Chambersburg Public Opinion in Pennsylvania highlighting Residents' Rights Month and the Franklin County Area Agency on Aging's PEER program. The Mayor of Washington, DC Muriel Bowser proclaimed October Residents' Rights Month. Levin & Perconti published a two-part blog series on residents' rights. Read Part 1 and Part 2. In honor of Residents Rights Month, the New Jersey Office of the Long-Term Care Ombudsman released a flyer that was created to help nursing home consumers identify and report questionable nursing home financial practices. The flyer was distributed via social media and is downloadable on the NJ LTCO website. In Maine, South Shore Elder Services hosted a luncheon for more than 115 residents from 24 skilled nursing homes to celebrate Residents' Rights Month. Balanced Senior Nutrition released a blog about Residents' Rights Month and nutrition. Read the blog here. Carolyn Torres from Texas executed a successful Residents' Rights Month event offsite from a nursing home. This is Carolyn's second year as an ombudsman and this event had more residents in attendance than the first year. 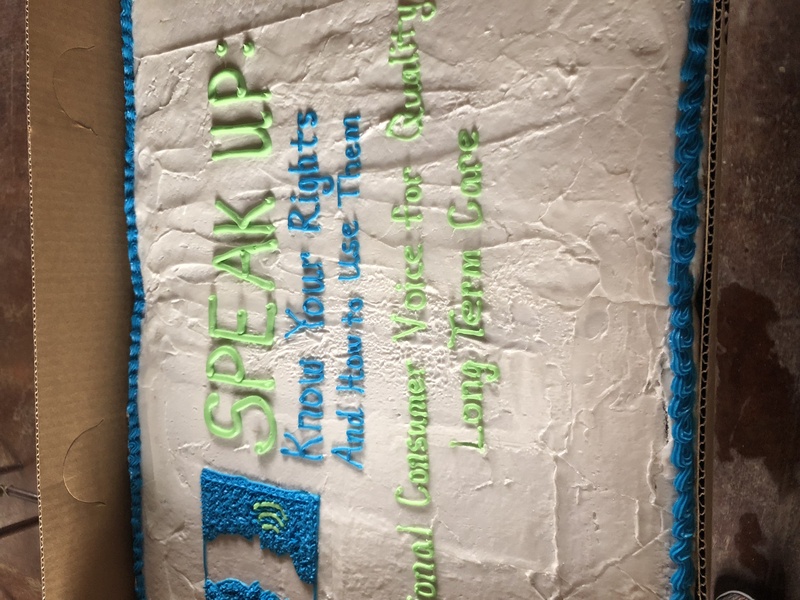 Check out their Residents' Rights Month themed cake! The Heritage Florida Jewish News featured a story on Residents' Rights Month. Long-Term Care Ombudsman Melissa Morrison from the Catawba Area Agency on Aging in South Carolina published a letter-to-the-editor in The Union Times. New Mexico State Long-Term Care Ombudsman Melissa Sisneros published an article on residents' rights in the Santa Fe New Mexican. In Midland, Texas, the Area Agency on Aing of the Permian Basin Ombudsmen held a Residents' Rights Gala. The event featured a performance by the Permian High School Satin Strings, local comedian Adrianne Green, UTPB's Ballet Folklorico, and live music from Espresso Charlie. The event included cake, barbecue lunch, and goody bags for the residents provided by Home Hospice, Odessa Regional Medical Center and various facilities. Throughout the event, residents were asked to state a resident right and explain how they would speak up if they felt a right was not being observed; they were awarded a gift card for answering. Also, facility staff and residents would improv various commoen issues in the facilities like bathing times, refusal of medications and complaints regarding food and staff. As these scenarios were acted out, residents pointed out the concerns and staff provided better ways of approaching these issues with person centered care responses. All of this is made possible by administrators, activity directors and social workers working in conjunction with the Area Agency on Aging Ombudsman Program. See a photo video from the event here. Michigan Ombudsmen distributed door hangers to residents to remind them of their right to privacy. In Oregon, the Governor proclaimed October Residents' Rights Month. See above for Residents' Rights Month information.